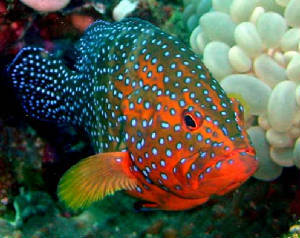 The elusive grouper becomes an easy target for photographers at Banaug Reef- Mantangale Alibuag Dive Resort's House Reef. The secret to this behavior can be discovered when you dive 70feet straight down aided only by a bouy line. Taken by Stan Dela Cruz with Olympus C7070 aided by macro lenses on supermacro setting. This critter has to be approached slowly so as not to threaten it. 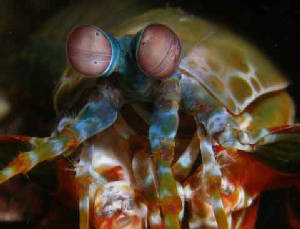 Once assured of safety, this shrimp can pose for portrait shots in its burrow. These Golden Anthias will sparkle with the rays of the midday sun. 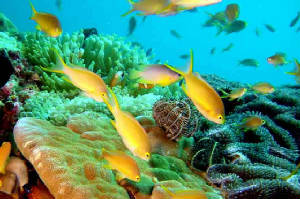 The finging reefs and the slow east to west current sends these beautiful fishes in a feeding frenzy. 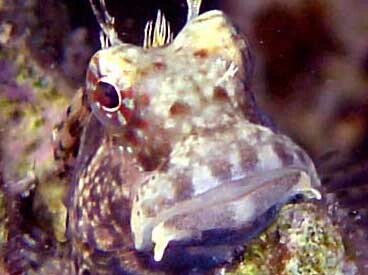 This blenny invites you to an island that is north of Surigao City and just 1 hour away by banca. Hagakhak Island within the Basilisa Island group in Dinagat. This resort is just in it's infancy and the sites are amazing both for snorkelers and divers. 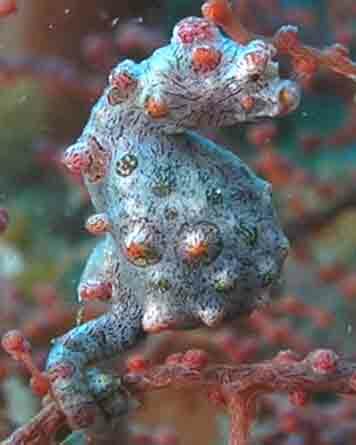 Less than a centimeter long and camouflaged against the fan coral, this critter is a sight to behold. The presbryopic diver will really have a hard time focusing on this one. 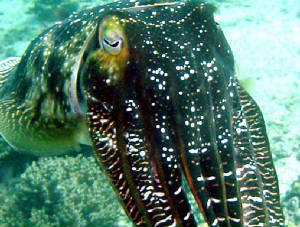 Can be seen in a dive site in front of Mantangale Dive Resort.